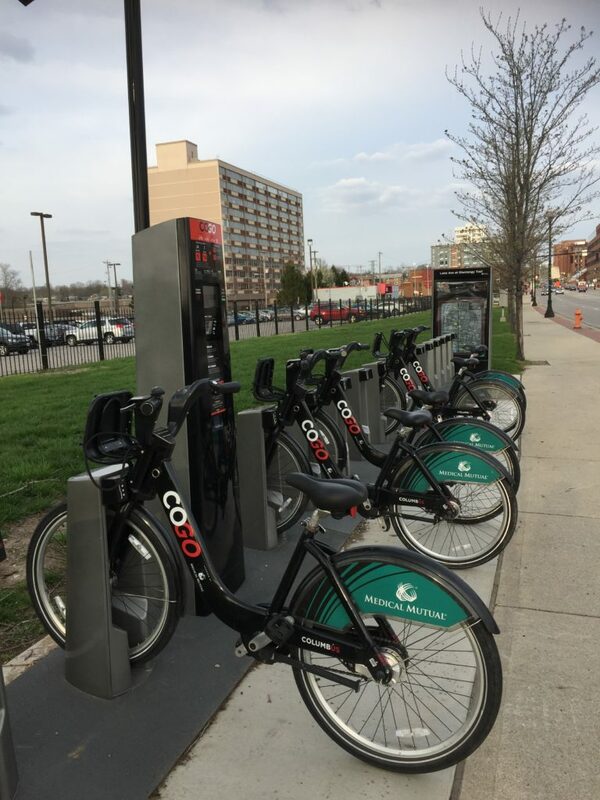 This is the second in a series of comparing the bike share programs in Columbus, Ohio, and Carmel, Ind. 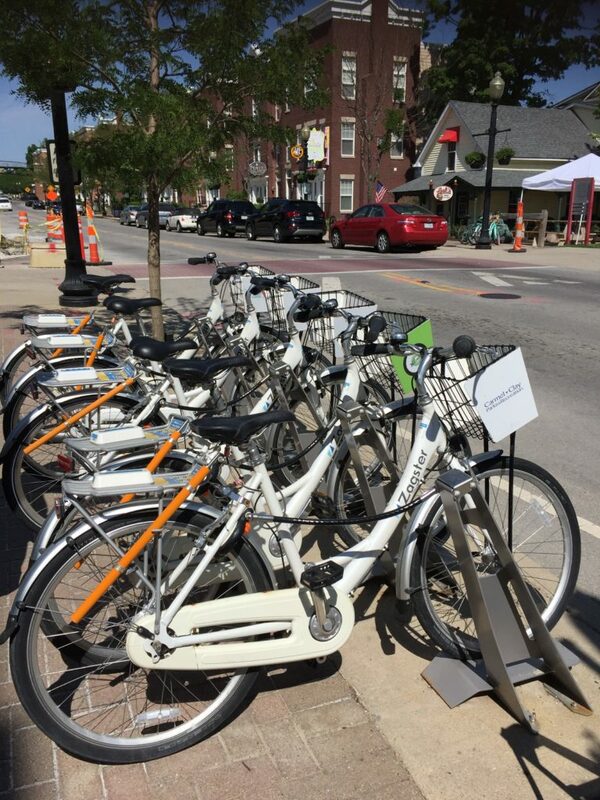 The bike share program in Carmel, Ind., is operated by Zagster, a company which offers more than 200 programs in 35 states. The setup is much different than other bike shares I’ve used over the years so I was very interested in trying out this program. 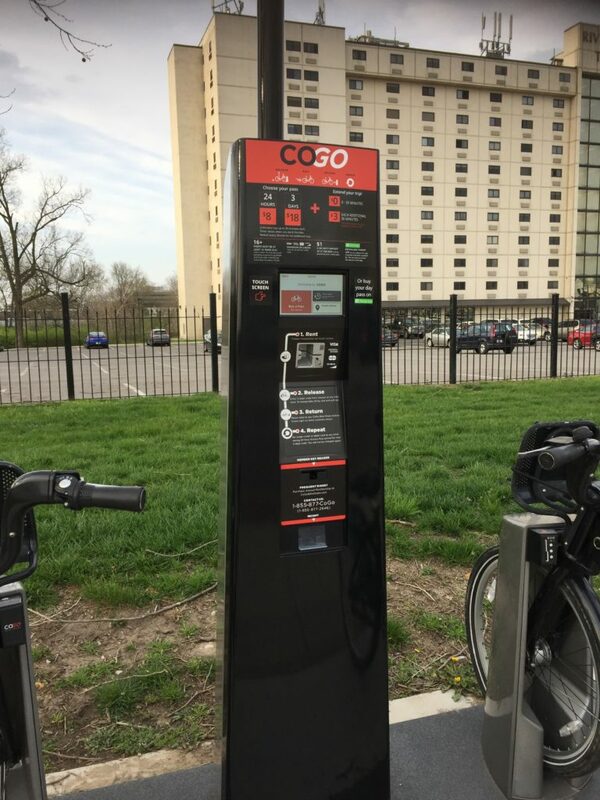 Instead of a kiosk and a bike docking station used by programs in many major metropolitan cities, the Zagster setup consists of a set of locked bikes at a station with an information board explaining the program. Payments and locking mechanisms are controlled through a smartphone app. 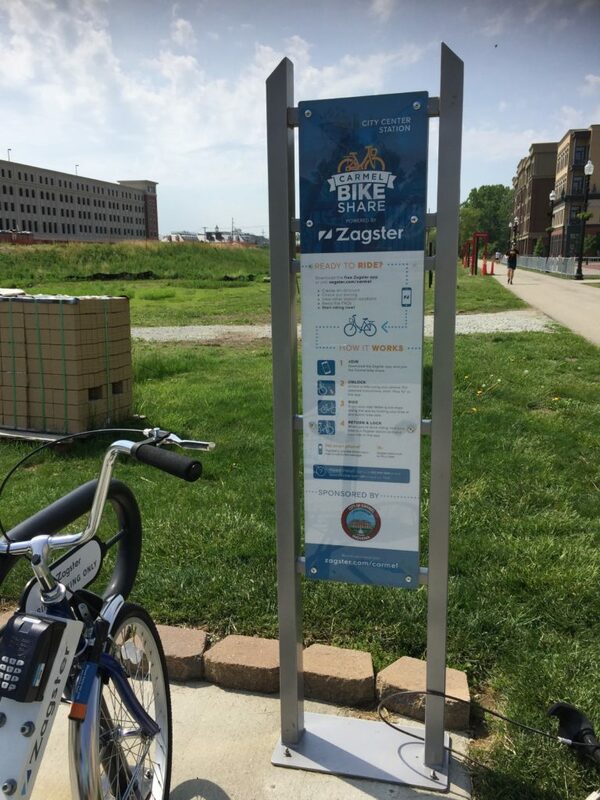 To use this type of bike share program, you need to install the Zagster app on your mobile device. If you don’t have the ability to download apps, you can arrange for payments and unlock bikes using text messages. Annual membership at $30 a year which includes free trips which are under an hour. After the first hour, users are charged $3 per hour up to $24 per ride. Monthly membership at $15 per month which includes free trips which are under an hour. After the first hour, users are charged $3 per hour up to $24 per ride. Pay-as-you-go which costs $1.50 every 30 minutes up to $24 per ride. In all cases, if a bike is kept for more than 24 hours, users will be charged an over time fee of $24. To use a specific bike, you find the bike’s number from the bike and enter it into the app. If the bike is available, you will be given an unlock code. This code is entered into the key pad on the bike. Once the bike is unlocked, you can remove it from the docking station. To return the bike to a station, you just park it and press and hold the lock button on the keypad until the light flashes. Then you find the orange tab on the lock and slide it down and place the docking cable into the port on the lock. Finally you tap “End Ride” in the Zagster app. At the station in Carmel, there were two different types of bikes available: a “cruiser” and a “trike.” Both bikes had baskets. Having only used the more traditional type of bike share program, I was a little hesitant in trying this one out. Fortunately this time, I was able to do so with my partner which was a great help and expanded our experience. For example, I had no problem downloading and using the app. But while my partner was able to download it, he could not get the app to give him the code to unlock the bike. So he used the text option to get the code which worked great. If he had not been with me, I probably would not have been able to see how the text function worked. 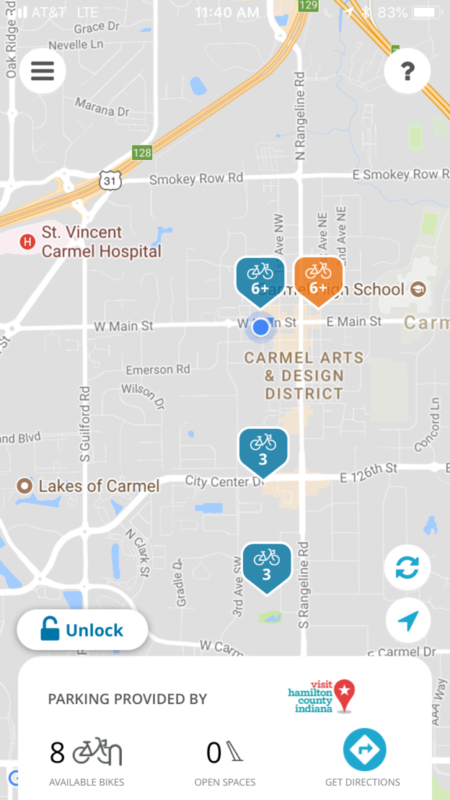 So we installed the app and went to a bike share station in the Carmel Arts & Design District. This is an example of how the map on the app looked for that area. You can see it is showing eight available bikes and no open spaces at the station colored orange which was on Main street and to the east of us. We also checked the one closer to us, and it showed seven available bikes with five open spaces. Screenshot of Zagster app on iPhone. One thing we discovered right away was even though there were several bikes shown as available and several bikes locked into the dock, once we went to the screen to choose the bike and get the code, fewer bikes were actually available. I was wondering if this is because some of the bikes were still “checked out” on rides and only temporarily locked there by the users. We eventually found two bikes, each of us bought a ride, and received an unlock code. The locking and unlocking process wasn’t obvious to us, but we did manage to eventually figure it out. Below is a photo showing how the bike is connected to the station. So there was no way I could stand listening to that for two hours. Fortunately there was another station a little way down the path so we stopped there for me to return the bike, pay the $1.50, and pick another bike that I hoped would offer a more silent ride. After getting it unlocked and starting off again down the trail, I was happy to find out this one made no noises. After our ride we went back to the Arts & Design District and returned the bikes. The best aspect of this system for me is that bikes do not have to be returned to a dock within a specific amount of time. This offers a lot more flexibility for users in choosing their routes. Bikes can be locked anywhere so users can stop along their ride to eat, shop, or explore. 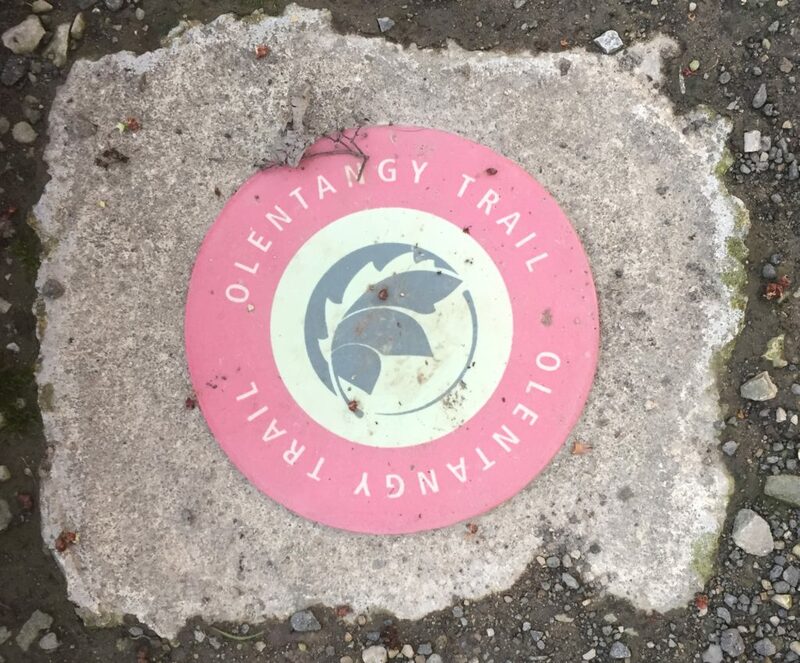 We saw users along the trail who had done this and were eating at restaurants along the trail. Once I got a bike that worked, it was easy to ride. The main issue for me was that twice we had problems with the bikes. While the cost to pay for another ride wasn’t much, it was annoying having to return the bike to a station and hope out of the few available bikes there, I would get one that would not make a noise. The actual number of available bikes seems to be less than what appears in the docking station and on the app. The setup and process to getting a bike takes some time to figure out. A person cannot check out multiple bikes. So if you are riding with someone they need to get a bike on their own. 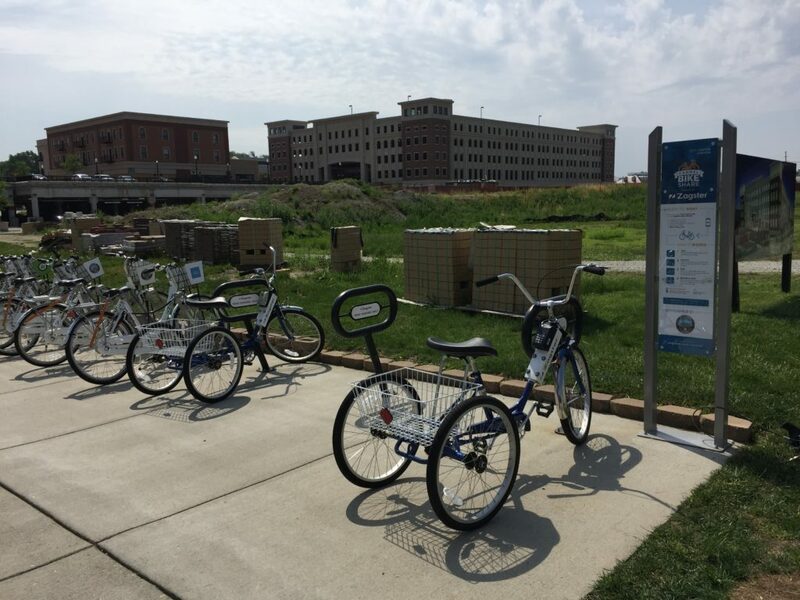 In comparing the two systems, I definitely prefer the Zagster bike share program. Yes there were some maintenance issues with the bikes and figuring out the process took some time. But not having to worry about getting a bike back to a station in 30 minutes made it definitely worth putting up with those other things. Also, the cost was very reasonable. 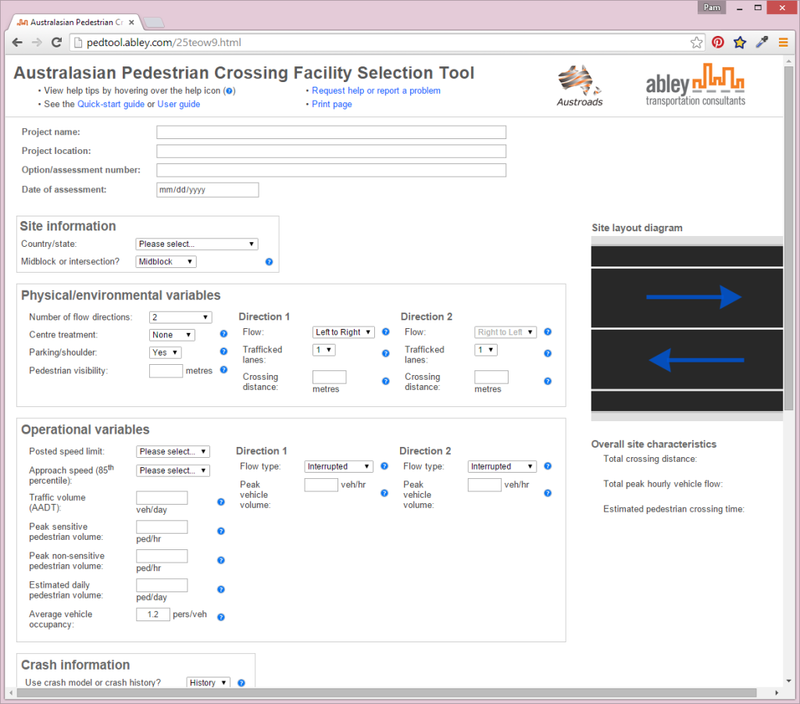 Last month, Austroads, the association of Australasian road transport and traffic agencies, released a Pedestrian Facility Selection Tool. According to their website, "the Pedestrian Facility Selection Tool is designed to help Australian and New Zealand practitioners select the most appropriate type of pedestrian crossing based on walkability, safety and economic outcomes." 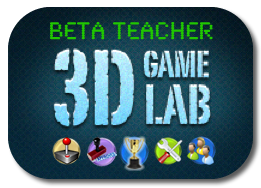 They have produced a User Guide and will be offering more information about the tool at a webinar scheduled for Tuesday, March 10, 2015. The webinar has already filled up, but the site indicates it will be recorded and offered on the website at a later date for viewing. or combinations of these facilities. Wombat crossing (Australia): treat as Zebra with platform and adjust posted/approach speed if required"
You can try out the tool by clicking this link: Pedestrian Facility Selection Tool Link, then reading the necessary guidance and inputs on the page, reading the disclaimer, and clicking the link at the bottom of the page to indicate your acceptance of their terms and to access the tool. Below are screenshots showing the top and bottom sections of the tool. For each option, "the tool then evaluates pedestrian and vehicle delay, safe sight distances, pedestrian level of service and, using default economic parameters developed for each Australian jurisdiction and New Zealand, calculates a benefit cost ratio." 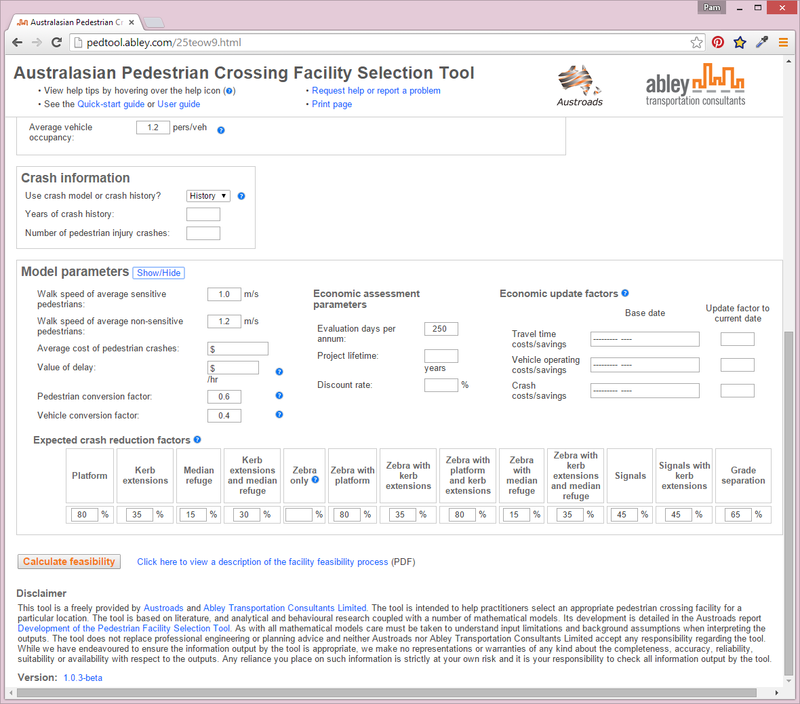 And if you are interested in learning more about the research undertaken to support and develop this tool, you can check out this report: Development of the Australasian Pedestrian Selection Tool. As I ride my bike through some of the grades, curves, and alignments along the bike paths in my area, I often wonder if the person who designed them rides a bike. Because I can't imagine anyone who rides regularly making some of the design choices I encounter. This got me wondering if the designer would have still made those same choices if they had to first ride their design before building it. Of course, up until recently this really would not have been possible. But thanks to newer technologies, this type of design tool could probably be implemented today, and here's how I'm thinking it could be done. Let's say I am given a project with the goal of designing a bike facility. This route could consist of a shared use path or an on-road facility or a combination of both. I would begin with a fairly traditional approach of analyzing potential alignments. Then after choosing one or more proposed routes, I would arrange to have these alignments surveyed, bring them into a CADD program like Autodesk Civil 3D, and start developing my design for each alternative. At this point, the final alternative would be chosen by analyzing the route for impacts, costs, public opinion, access to specific destinations, property acquisition issues, and other typical factors we usually consider when finalizing a design. The downside of this approach is that the actual performance of the facility can never be assessed. It is just assumed that if the engineer followed the same design criteria for each alternative, they would all perform in a similar manner. However, based on specific environmental conditions or design choices, this might not necessarily be true. Then it is not until the route is built and the money is spent that the users realize there are some issues with the design. So how can we use newer technologies to overcome this inability to assess our design before actually building it? During the stage in which we analyze the alternatives, we could export a 3D model of our design. 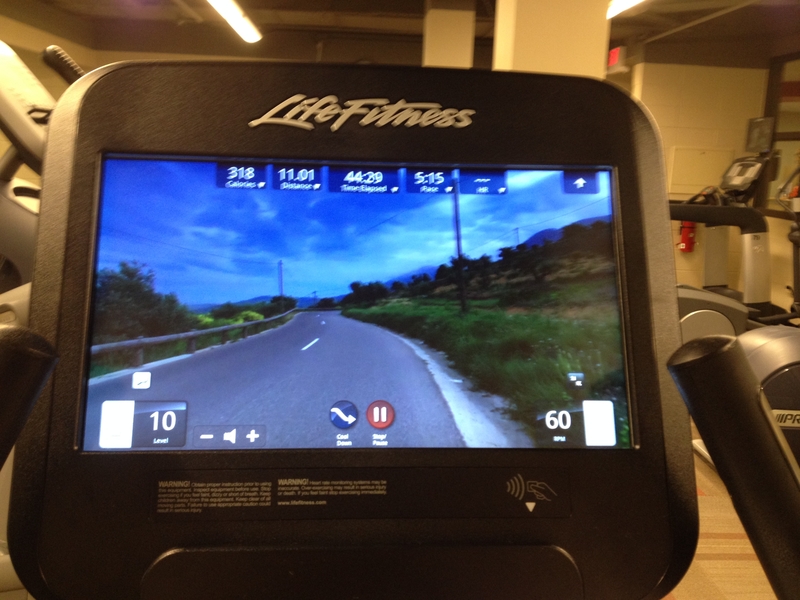 Then we could upload it to a stationary bicycle that has a screen display of our route. The computer on the bike would then pick up the design parameters such as slopes, lengths of segments, curves, etc., and then program the bike to react to those parameters. So if I have designed too steep of a slope for too long of a distance, it will become very obvious as I actually bike that route. And while this could be done simply to analyze only the design of the path, other models such as terrain, trees, intersections, and buildings along with environmental conditions such as wind, sunlight, and perhaps even traffic flow could also be added to allow for a more detailed analysis of how the environment impacts the path. In addition to having the engineer bike their own design, potential users of the path who span a whole range of abilities could also bike the design and offer input and comments. So how close are we to being able to do this? I suppose that is a question for the companies manufacturing stationary bicycles. I know they can take a route and project it on the screen as you can see in the photo at the beginning of this post. And I know they can adjust the bike for grade/resistance. But can they read essentially what would be metadata about the images being displayed and use that to control the grade? I don't know with the current bikes, but I am sure if it's not possible now, it could definitely be programmed to function in this manner. As for exporting a file from Civil 3D that could integrate with a stationary bike in this manner, I would think based on how innovative Autodesk has always been that company would have no problem figuring this out. And even though my main thought in all this was to help us design better bike facilities, it also made me wonder if something like this could lead to a whole new industry for civil engineers in which we design virtual bike experiences for stationary bikes too! A lot of off-road paths are lined by trees. This can create a few issues that could cause a cyclist to fall and possibly be injured. This can occur in the colder climates because trees drop leaves that can pile up and become slippery if not cleared. Trees also drop seeds such as acorns or walnuts. Hitting these the wrong way could cause a cyclist to lose balance and fall. I know of at least one agency that regularly sends out a small sweeper about once a week to clear debris, particularly in the fall and that maintenance activity appears to keep the path in that area fairly clear. Trees can also cause damage to the path from roots. 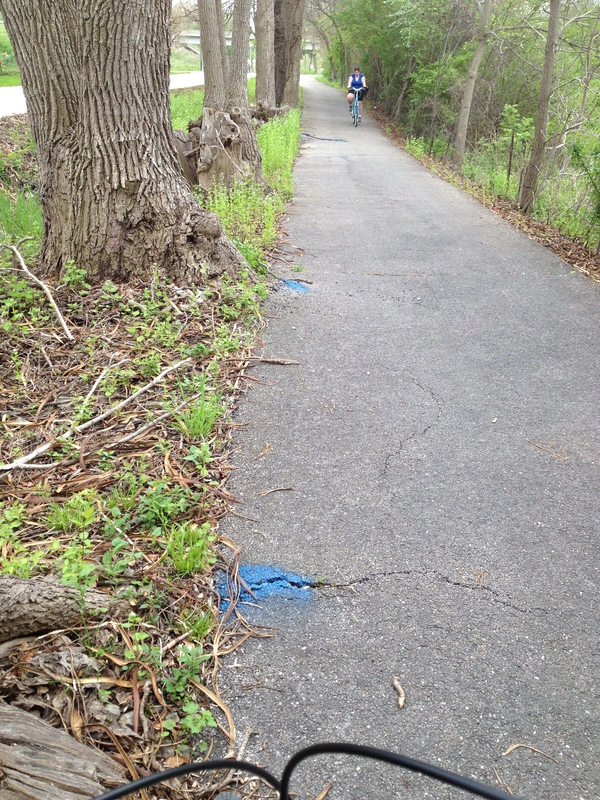 As you can see in the photo here, someone has marked areas of the path where trees have caused the path to heave. If a cyclist did not see these bumps, they could lose balance and fall. The tree's proximity to the path can also cause a potential for problems. As shown in the photo, trees are often located very close to the pavement. If too close, the trunks of the trees can also grow into the pavement. One day when we were riding in another area of this trail, we saw a cyclist miss navigating a curve and hit a tree that was very close to the path. He fell and fortunately was not hurt. But it made us wonder if there should be a clear zone for bike paths similar to the concept used for roadway design. The Washington State Shared-Use Path Design Manual does call for a horizontal clearance of two feet (page 1515-5). A lot of the trails we ride follow a river so quite often we end up having to navigate steep slopes when the path changes course away from the river. There have been a few instances where it seemed the designer could have mitigated the slope by lengthening out the transition, but instead took the shorter route which resulted in a slope almost steep enough to require us to dismount and walk our bikes. We've also wondered why when a bike route we follow is moved onto streets, the steepest street in the area is chosen for the route. One of the roads we ride along is so steep we definitely have to get off our bikes and walk them a block or two until the route turns down another, flatter street. 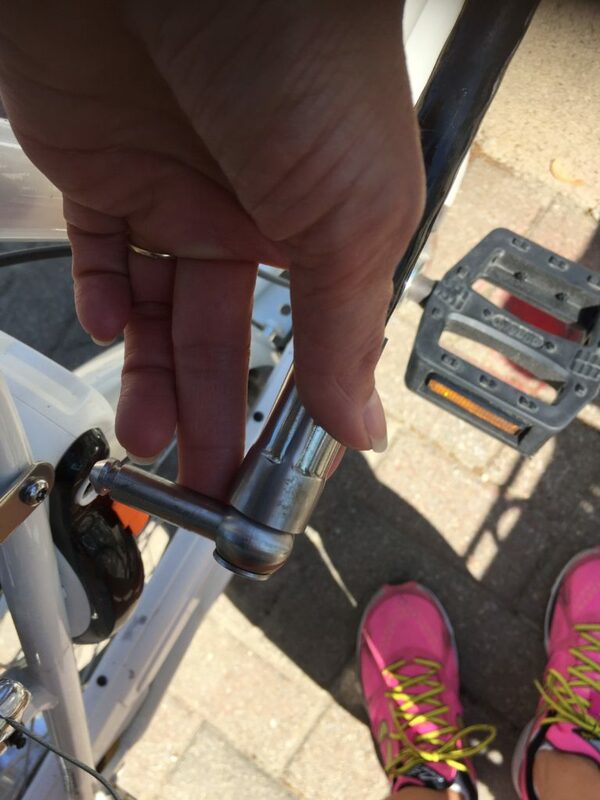 I realize the calculation for bike level of service does not take into account grade – probably because it was developed in Florida along flat routes – but if I have to get off my bike, I am no longer able to use it as a bike route which would seem to mean a complete failure of that bike facility. So I definitely believe grade should be incorporated into the Bike LOS calculation. The other problem with steep slopes is that they require a lot of energy and momentum to ride up. And because many paths we bike along seem to have been designed with a steep slope immediately adjacent to an intersection with a road, we end up going up the slope approaching the road at a high rate of speed and with a lot of momentum then have to slam on the brakes immediately as we hit the road. 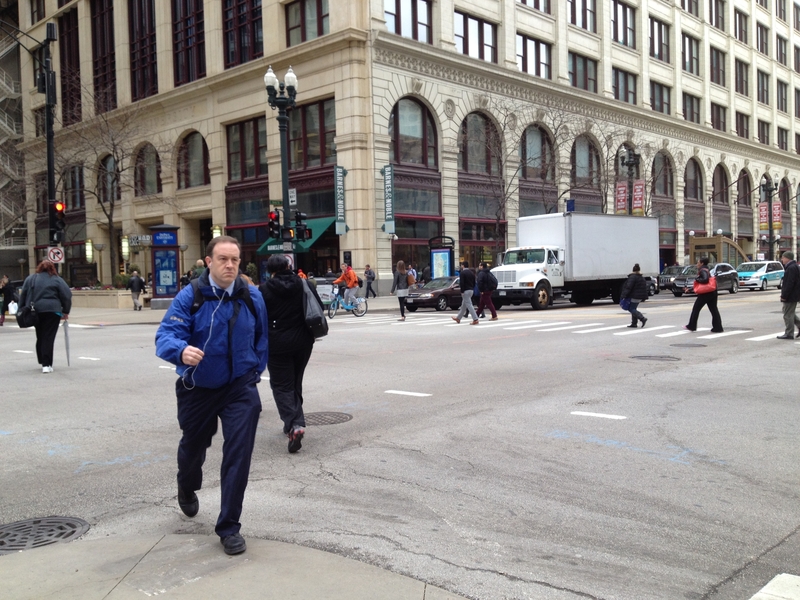 I always wonder how we appear to the cars that are approaching the crossing. I would think it looks like we are not going to stop. The other problem with this design is there is usually no flat area at the top of slope at the road intersection. So as you wait for the cars to go by, you are sitting on that steep slope which makes it even more difficult to start moving again and quickly pedal across the road. A better design would seem to be to pull back the slope slightly and allow for a flatter area at the top where the path intersects the road. The question would be what distance would work best here? Another consideration would perhaps be to give a widened area at these intersections to allow for several users to queue while they wait to cross. The other area where slopes seem to cause problems is at stream crossings. On the paths where we ride, there are many of these crossings and usually the downgrade is very steep on both sides of the bridge. So the ideal approach would be to ride fast down the hill and across the bridge so we have enough momentum to assist in making it up the hill on the other side. Unfortunately most of the designs have brought the slope down almost to a "V" at the edge of the bridge instead of designing in a gradual vertical curve. And because the joint where the asphalt path meets the bridge is not always smooth, we end up having to reduce our speed to make it over this severe change in grade that might also have a bump. So the only distance we have to build up speed again is across the short bridge which usually isn't enough. It seems that there is some guidance out there for sight distance, but that doesn't help riders on paths that were built with no thought to this design consideration. 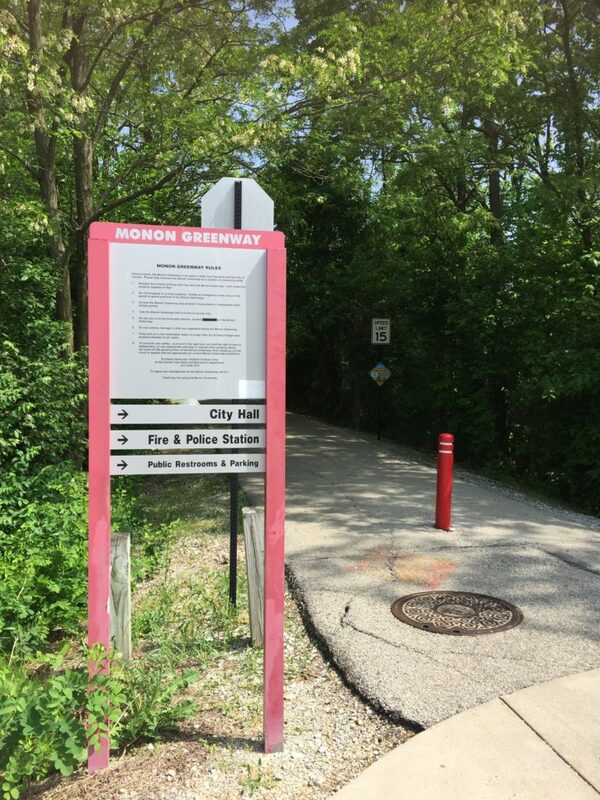 Perhaps on older facilities, agencies responsible for the paths could go back and assess their facility and add in striping or signs to let cyclists know there are potential sight distance problems in a specific area. Surface material of areas adjacent to bike paths can cause damage to the path or unsafe conditions for users of the path. 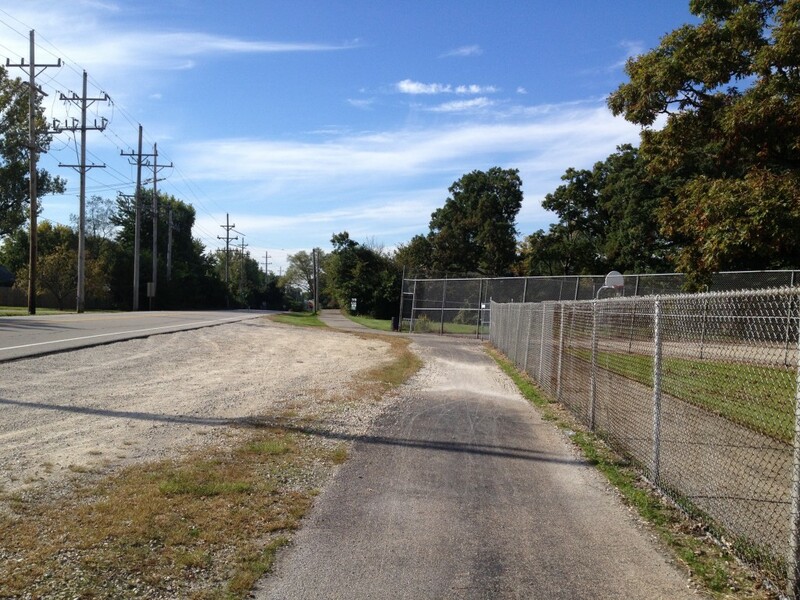 For example, one trail we ride is located next to a gravel parking lot near a school. After riding through here a few times, we've gotten to the point where we now remain in the road through this section because there is always a lot of gravel on the path. This appears to be due to the drainage design and grades of the road, lot, and path in this location. As water flows from the road and across the lot, it picks up gravel from the parking lot. Then as the water flows across the path, the gravel drops out onto the asphalt, possibly because the path looks like it could be a localized low area. The gravel on the path is difficult to ride over and can cause instability to a cyclist which can result in them falling and possibly getting injured. Path material is definitely an important component of a bike path. There is a path we ride along, or I should say used to ride along, where the agency decided to place asphalt grindings over the crushed gravel that was initially placed as the surface. Grindings are definitely a material that should never be used for a shared used path or even a dedicated bike path. There are usually few fines in it unless it has been processed to have fines added which usually isn't the case. So riding along a path made with grindings ends up somewhat similar to the experience of riding on marbles. We also came across another path where an agency had placed sand. Riding in sand is also not very easy. So as you can see in the photo below, people appear to avoid it by walking their bikes through the grass which is exactly what we did. The FHWA provides some guidance on surface materials for shared-use paths as part of their Designing Sidewalks and Trails for Access Part II of II: Best Practices Design Guide. 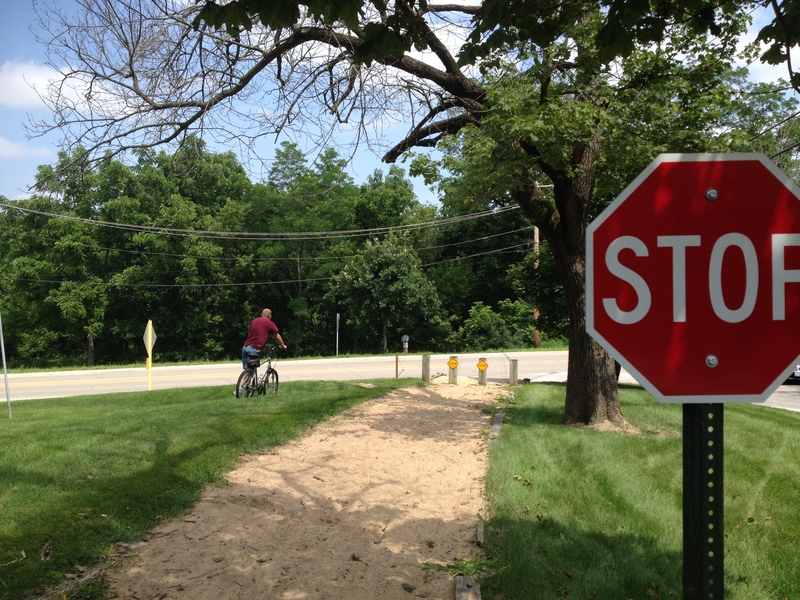 Another issue we noticed along many bike paths is a lack of directional signage. 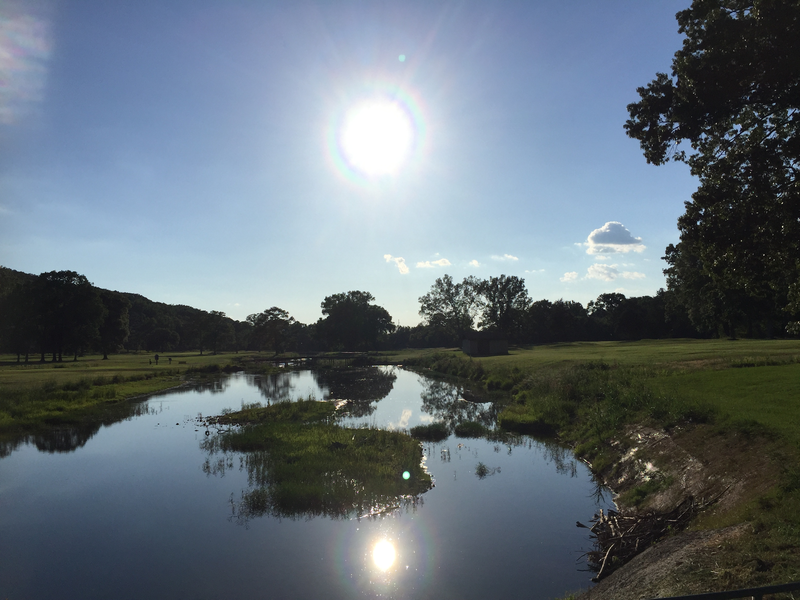 One day last year, I decided to go on a 30+ mile bike ride that took me along many routes with which I was not familiar. One particular route required me to transition between trail and roadway several times. Unfortunately it was difficult to navigate using my phone since it was having battery issues and didn't make it through most of the trip leaving me stranded with no map. Fortunately there was another cyclist who knew exactly where to go to get off one trail, make our way through a maze of streets and connecting trails and manage to end up where two main trails picked up again. And he was nice enough to realize I was lost and needed his guidance. Just a few well placed signs would have really helped me find my way because I really can't go biking on a regular basis hoping there will be a nice person there who knows the way and will help. This month's infographic is courtesy of H&R Block and is in honor of Bike Month!